Product prices and availability are accurate as of 2019-04-03 09:17:23 EDT and are subject to change. Any price and availability information displayed on http://www.amazon.com/ at the time of purchase will apply to the purchase of this product. Get high performance fax you can rely on with this easy-to-use HP 1250 Color Fax Machine!With the HP 1250 you can get powerful plain paper faxing as fast as 3 seconds per page in black and color with a 33.6 Kbps modem. Plus, get faster desktop copying speeds up to 20 ppm black and up to 13 ppm color!Conveniently copy and send multi-page faxes with the 20-sheet automatic document feeder. Work with ease using one-touch buttons and up to 100 speed dials to save time and effort. Its space-saving design with fold up tray can fit almost anywhere in your home or office! The HP Fax 1250 Fax Machine is a compact, space-saving device that is ideal for small businesses and home offices. Its fast, efficient, and reliable operation gives you high quality results in less time, so you can focus on other things. One of the many special features of this fax is that it conveniently uses plain paper. Plus, it has 100 speed dials, a handset, a junk fax barrier, and scan-and-fax broadcasting. With the FAX 1250, you can even receive (and send) faxes in color. The Fax 1250 is designed for optimum speed, convenience, and quality. 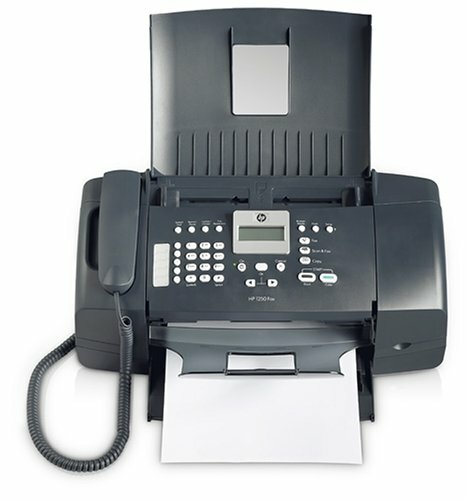 Unlike conventional fax machines, the Fax 1250 lets you fax and copy on plain paper in both black ink and color; the system also accommodates letter, legal, or A4 size paper. The Fax 1250 also makes multitasking a breeze by making it possible for you to scan and queue multiple outgoing faxes even while transmitting others. You can even store up to 200 incoming pages; there's no need to miss a fax if you run out of paper or ink. When printing multi-page faxes, it's easy to keep things neat with the 20-sheet output tray. For optimum readability, the system also allows you to reduce and enlarge copies by 25 to 400 percent. Other convenient, time-saving options include the ability to locate and store fax numbers with the easy speed-dial search, and the paper-saving capability of blocking junk faxes by using caller ID to screen incoming calls. Plus, you can access printing supplies in one click anytime you need them: sign up at HP's "My Printing Supplies Store" and save a list of your printers for hassle-free ink, toner, and paper reordering. The Fax 1250 works quickly and efficiently, offering you high productivity. With a transmission speed of three seconds per page, you'll never have to waste time waiting for a fax. Get high-quality results with the 300 x 300 dpi faxing resolution in photo mode and fax in as little time as three seconds per page with the 33.6 Kbps modem. Save time with the 100 programmable speed dials and 20-page automatic feeder for multiple-page faxing at the same time as you save space: the tray folds up, making this compact machine easy to fit where you need it. This machine also has an incoming fax memory of up to 200 pages, so even large faxes come through with ease. Plus, the 100-sheet input tray and 20-page ADF ensure that there's no need to constantly re-supply paper. For added conveniences, the Fax 1250 is compatible with three different ink cartridges: the HP 21 Black Inkjet Print Cartridge (5 ml), HP 22 Tri-color Inkjet Print Cartridge (5 ml), and the HP 27 Black Inkjet Print Cartridge (10 ml). The Fax 1250 comes with a one year limited warranty. Plus, you can rely on HP's renowned Total Care service and support, which J.D. Power and Associates has recognized as consistently providing "an outstanding customer service experience." HP 1250 fax, HP 21 black inkjet print cartridge, HP 22 tri-color inkjet print cartridge, setup guide, reference guide, power cord, andphone cord. Satisfaction Ensured. Manufactured to the Highest Quality Available. With True Enhanced Performance. Latest Technical Development.